Samsung: Your Galaxy Smartphone, Tablet, Windows 8 Partner? 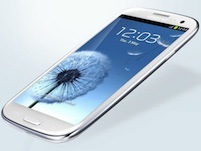 The Samsung Galaxy S III smartphone apparently has sold 10 million units. Meanwhile, Samsung continues to build out its portfolio of tablets, ultrabooks, Google Chromebooks and Chromeboxes. Taken together, Samsung is starting to look like a complete hardware supplier across Android, Chrome OS, Windows 7 and soon Windows 8. Will channel partners jump on the accelerating Samsung bandwagon? The news hook: Samsung’s Galaxy S III smartphone, has hit the 10 million units sold milestone, according to Barron’s Investors Business Daily. Samsung is riding the growing popularity of Google Android — while establishing the Galaxy brand as a true alternative to Apple iPhone and iPad devices. Galaxy smartphones and tablets based on Android. Ultrabooks and other Samsung laptops that will soon run Windows 8. Multi-function printers (MFPs) and other hardware for managed print services. Digital signage solutions and LED displays. Thin Client Cloud Displays plus Google Chromebooks and Chromeboxes. It’s as if Samsung wants to offer channel partners every potential end-point customers need during the age of cloud computing. The big question: Is Samsung communicating the full value of its portfolio to VARs, or do most solutions providers think of Samsung as a consumer technology company? Hmmm… The VAR Guy needs more time to ponder that question. In the meantime, some of Samsung’s products continue to enjoy record sales growth. That fact alone should inspire partners to give Samsung a look.